Click here to view this week’s Focus. 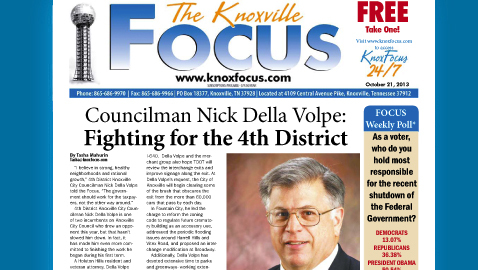 4th District Knoxville City Councilman Nick Della Volpe is one of two incumbents on Knoxville City Council who drew an opponent this year, but that hasn’t slowed him down. In fact, it has made him even more committed to finishing the work he began during his first term. A Holston Hills resident and veteran attorney, Della Volpe has been involved in the community for over 40 years. He is currently working with the Tennessee Department of Transportation (TDOT) on behalf of East Towne area merchants to improve the visibility of the more than 100 stores along Exit 8 off of I-640. Della Volpe and the merchant group also hope TDOT will review the interchange exits and improve signage along the exit. At Della Volpe’s request, the City of Knoxville will begin clearing some of the brush that obscures the exit from the more than 60,000 cars that pass by each day. In Fountain City, he led the charge to reform the zoning code to regulate future crematory building as an accessory use, addressed the periodic flooding issues around Harrell Hills and Vitex Road, and proposed an interchange modification at Broadway. Additionally, Della Volpe has devoted extensive time to parks and greenways- working extensively to expand Tank Strickland Park. He helped insure the demolition of buildings and helped obtain donations of top soil- working alongside volunteers to plant grass and trees once the buildings were removed. Most recently, Della Volpe picked up the torch on earlier greenway efforts and was instrumental in getting city crews to finish placing stone on a half-mail segment of Loves Creek Trail. Although he works alongside constituents and is committed to improving and maintaining the health of the neighborhoods inside his district, Della Volpe, admittedly, is not afraid to take on key issues. “I have worked on battling urban blight, protecting our hillsides, and urging fiscal responsibility in all things, including the city pension system,” he added. Della Volpe garnered 64% of the vote in Knoxville’s primary election against challenger Rick Staples, a Democrat active in the North Knox community. Many North Knox residents report receiving calls from special interest groups, such as the Fraternal Order of Police and the Firefighter’s Association, urging them to “vote Staples.” Della Volpe remains undeterred. “It is unfortunate that my opponent is trying to turn this city election into a partisan race, and that he is being fronted by special interests like the FFA. Our city is essentially a service provider. It is not about national partisan politics. It should be run for the benefit of the taxpayers, not special interests,” he told The Focus. Nick further maintains that he wants to protect city workers by making sure the pension plan is sustainable, so they don’t end up without a pension after retirement because the burden of funding it is too great. He reiterates that he doesn’t want to do away with the pension. His goal is to ensure that that out-of-control pension obligation doesn’t bankrupt the city as it has in other parts of the country. He added that the city’s current pension plan is underfunded by some $200 million, more than the city’s annual budget of $180 million. Early voting for the General Election began on October 16 and runs through October 31. Election Day is November 5th. “Thank you for choosing me in the Primary. I ask for your support and vote in the General Election,” Della Volpe added.